A tile roof is the quintessential way to cap a home or commercial building sporting a Spanish style here in Florida. It also helps keep the cool vibe in a home sporting a beach theme and nod to the sea. Not only that, but you might find it surprising that a tile roof is a stunning way to add a bit of flair to a modern design in any building. It’s no wonder that a tile roof lends itself to such versatility in the looks department. The variety of colors, styles, and types clay tiles come in is staggering. And that means that even if every building on your block has a tile roof, no two are alike. So each structure maintains its own individuality. What you might not realize is just how sturdy a tile roof is. Yes, you have to be careful when handling individual clay tiles because they’re fragile. But once they’re installed on your roof, you won’t have to think about them again for many, many years. That’s because a properly installed tile roof is long-lasting and extremely durable. It resists weather, insects, and burning. 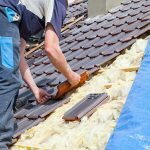 In addition to increasing the safety and lifespan of your roof significantly, these factors also help you keep the cost of insuring your home or commercial building down A tile roof also resists UV rays, which helps reduce the cost of cooling your home. Plus, it’s extremely low maintenance, making for a great investment that saves you time and money overall. At JKS Florida, our roofing experts specialize in giving you the best tile roof you can get and installing it with prompt, quality craftsmanship. It’s part of our commitment to going the extra mile in serving our customers in the Panhandle with courtesy, efficiency, affordability, and reliability. Let us show you what a difference a clay tile roof can make in the aesthetic and safety of your residential or commercial building.